Being a mom is the hardest job of all, but sometimes moms need a break too! That’s why Purex is celebrating Mother’s Day and the release of Sony’s new motion picture, Moms’ Night Out, by giving away a night out for you and up to five friends. So get your BFFs together for a night out on the town, courtesy of the laundry BFFs from Purex, and enter for your chance to win today! Click here to watch an exclusive clip of the movie in theaters May 9, 2014 – Mother’s Day Weekend. NO PURCHASE NECESSARY to enter or win. Purchases do not increase odds of winning; odds depend on number of eligible entries received. Void where prohibited. Open to legal residents of the U.S. and DC, age 18 or older at time of entry. Retail value (ARV) of Grand Prize: $1,123; ARV of Second Prizes (10): 1,140; Total ARV: $2,263. 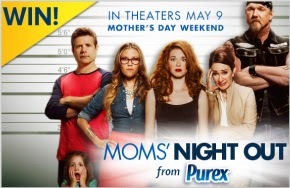 For complete details and official rules, visit www.purex.com/moms-night-out-sweepstakes-terms. Enter by May 11, 2014. Sponsor: The Dial Corporation, 7201 E. Henkel Way, Scottsdale, AZ 85255. Movie Artwork © 2014 CTMG. All Rights Reserved.